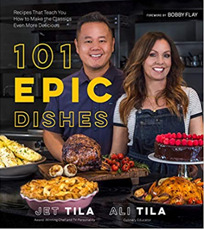 Jet Tila of bestselling 101 Asian Dishes You Need to Cook Before You Die is back with his interpretation of classic dishes that every home cook needs in their back pocket. With a brand new gig on Iron Chef America, regular TV appearances on other national cooking shows such as Cutthroat Kitchen and Chopped, connections to big-name cooking stars, plus a bestselling debut cookbook, Jet Tila is taking America's food scene by storm. In his second cookbook, Jet partners with his co-chef and wife, Ali, to teach people how to cook food like they do in restaurants via specially curated, amazing recipes. With solid training and cooking experience, Jet knows how to cook well, develop high-quality content that people crave and sell it. The recipes are easy and beginner-friendly, but have that extra special flavor twist and/or key technique that makes them stand out. One incredible meal at a time, Jet and Ali give you dependable, must-make recipes like Prime Rib with Au Jus, Fettuccini Carbonara and Duck Breast with Blackberry Gastrique. Jet's takes on classic dishes like Roasted Tomato Soup with Parmesan Crisps and the Ultimate Cheeseburger will become new favorites. For anyone who loves Jet Tila or just awesome food, this cookbook is packed with fun, flavor and good vibes with the bonus that you're learning new techniques to cook like the pros. This book has 101 recipes and 60 photographs. Jet Tila is a celebrity chef/TV personality and the author of 101 Asian Dishes You Need to Cook Before You Die. He will appear as a co-host on Iron Chef America in spring 2018. He has previously appeared on Cutthroat Kitchen (as a judge), Today, Chopped and Beat Bobby Flay. He has a devoted online following, with over 168k Facebook followers. As Jet's wife, co-author Ali Tila takes an active role in his online media and assists with his written work. They live in Los Angeles, CA.